Oral sedation creates a deeper level of sedation than nitrous oxide. Dr. Lankupalli and Dr. Patel will prescribe a medication that you take before your appointment to reduce anxiety. A wide variety of medications are available for this type of sedation, and Dr. Lankupalli and Dr. Patel will carefully discuss your individual needs to determine which choice works best for you. All these medications are classified as anti-anxiety medications and achieve the same result: reducing and even eliminating the negative emotions associated with dental treatment. 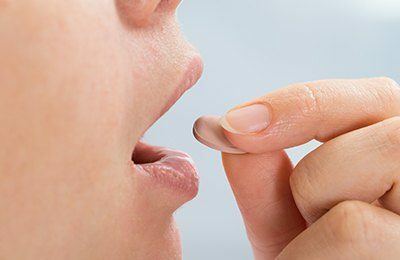 In addition to making your experience more comfortable, oral sedative medications help reduce your memory of the experience. It allows us to complete your treatment in less time and with fewer appointments. While your treatment is performed, Dr. Lankupalli and Dr. Patel carefully monitor your vital signs to ensure that your experience is as safe as possible. Another advantage of this type of sedation is that it can safely be used along with nitrous oxide for an even deeper feeling of relaxation. Because the effects of oral sedation last longer than with nitrous oxide alone, you will need someone to bring you to your appointment and drive you home after.